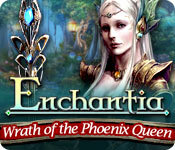 Enchantia: Wrath of the Phoenix Queen is rated 4.1 out of 5 by 65. Rated 5 out of 5 by hermitcave from A 500 year old vendetta to destroy Enchantia and you, the Skybird destined one, and songbirds must prevent it The inhabitants of Enchantia had become arrogant and the Ancients decided that all of Enchantia was to be destroyed and a new Enchantia to rise out of the ashes. They called upon the Phoenix Queen to do their bidding and an epic battle occurred that destroyed the Elven Kingdom located in the Midnight Forest and the Elven Queen, Isandra, was killed and her body was possessed by the Phoenix Queen. A young Half-Elf, Terryn, a wizard, was there and was able to trap the Phoenix Queen and seal her in vault before she could carry out her desire. Five hundred years has passed and you, a young apprentice, are having nightmares about the Phoenix Queen's return. You awake from your latest dream riding in a carriage being driven by an old man, your teacher, Terryn. You arrive at your destination which is the site that was a worship altar to the Ancients and became the site where the Phoenix Queen was sealed and he remarks that the he has never seen the door glow as it is now. When he touches the door, an electrical shock knocks him back but he tells you that he is fine and to use an emblem to open the door. Placing the emblem opens the door and inside the chamber is an altar with a claw and spaces for two symbols, water and earth. After finding the symbols and placing them, a hidden nook opens containing the Elemental Artifact but you are not sure of its use yet. You show the artifact to your teacher when suddenly a plume of fire errupts from the altar and the Phoenix Queen appears. Terryn is surprised at her appearance and she tells him that she can now finish what she started 500 years ago by destroying all of Enchantia. Her attention is drawn to a birthmark you have calling it the mark of the Skybird and tells you she has to destroy you first. As she focuses her power on you, your teacher is able to prevent her from harming you but is injuried. As she leaves, the Phoenix Queen tells him she will return after finding a relic necessary to restore her powers and he will not be able to save you or Enchantia. Your teacher tells you that you must find the relic first and defeat her before she can destroy Enchantia. 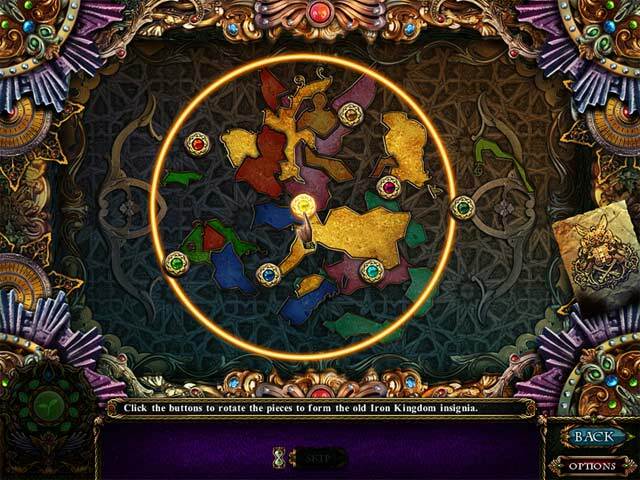 He gives you a Mystical Compass that will teleport you to various locations in Enchantia if you have the coordinates. The coordinates for the Midnight Forest has already been entered so you must travel there to begin your seach in what is left of the Elven Kingdom for the relic. You must fulfill the ancient prophecy of one born with the mark of the Skybird as the destined one to defeat the Phoenix Queen and save Enchantia. This is a somewhat original story [yes it is a chosen one basic theme but the story is good] that chronicles the history of the Elves, Dwarves, and humans providing additional side stories that support the main objective. Unlike most games, not all outcomes are storybook endings as some may leave you less than satisfied much like real life. You encounter many well defined characters with quests to be completed to get to your final objective so there are a lot of things to do. With many locations to visit, the graphics are beautifully done and finely detailed with varying themes matching the story to each location providing a smooth and interesting path through the game. Voice acting is very well done enhancing the characters you meet. There is a map that allows you to jump between main areas but once in that area, there is no jump travel between the multiple locations within the area. There is some backtracking, some between areas, so it is a good idea to keep notes of what is needed where. Inventory puzzles and minigames are well done providing some challenge and fitting into the story and location very well. 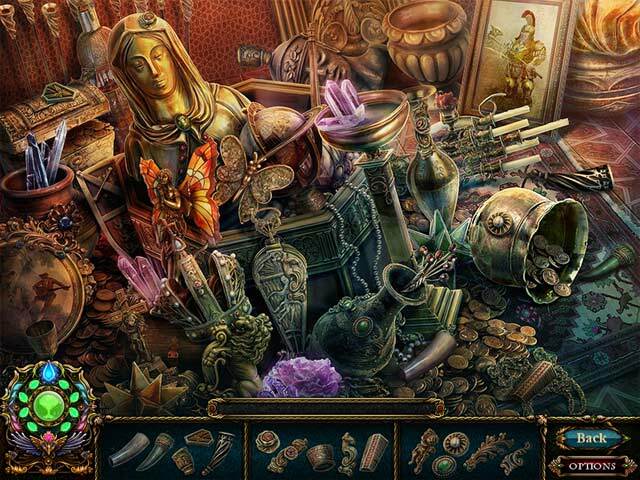 Hidden object scenes are fragmented objects that present a three section menu bar with multiple pieces of an object part displayed in each section that combine into a single object when all three parts are completed. Many of the pieces are well blended into very detailed scenes providing some challenge. This is a long game but the flow doesn't bog down so it goes by fairly fast and is definitely worth checking out. Rated 5 out of 5 by kheitl from Great SE game I just played through the SE version; now I may also get the CE for the extras. I love this developer, love the style of the HOS, where you find pieces to assemble into objects that you can actually use in the game. The mini-games were solvable but still challenging and actually require some thinking instead of just repeating some random action until you accidentally hit on the right solution. Graphics are well done, visually stunning at times; the music is great; voices are well done and I loved most of the characters; and the storyline is engaging right up to the end. I thoroughly enjoyed this game and think it's worth getting in either the SE or CE version. Rated 5 out of 5 by Ancientsymbols from Nice Game! Great Game! Wonderful imagery and landscape scenes are spectacular with unique mythical characters. May want to definitely keep up with where your going and where you have been. I got turned around a lot in this game, but it was a hoot for me, Loved it overall. Rated 5 out of 5 by deeanddeeann from AWESOME!!! THATS ALL I CAN SAY!!!! it's like dark parables. it has elves, magic, what more could you want. the music was so good. you never wanted it to end. Rated 5 out of 5 by sdemers from Awaome I love HOS like this ware you find things to put together, instead of finding the ball, or the bell it's more challenging I have all of them. Rated 5 out of 5 by AyeKCB from One is enchanted I could say I was enchanted during the entire time that I played this game. I was caught up into the story which the developers focused with every challenging aspect. 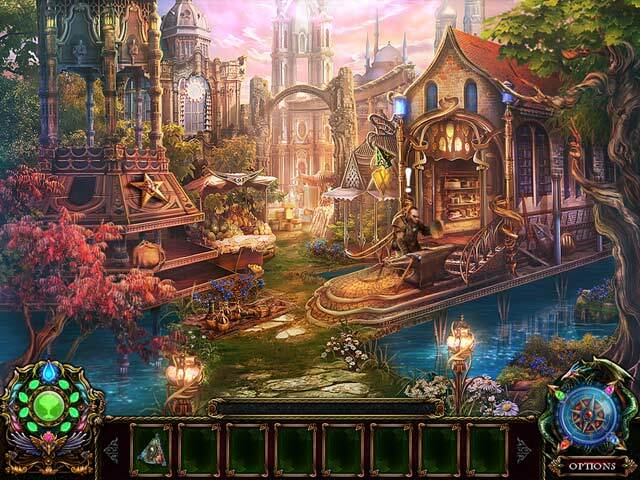 Lovely smooth graphics, picturesque sceneries and interesting game play. Long enough to have a good few hours of enjoyable entertainment. Lots of good mini games and enough HO scenes without too much to detract from the story. There is nothing not to like in this HOG. A definite keeper. Waiting for more of the same. Rated 5 out of 5 by Starryid1 from Enchantia: Wrath of the Phoenix Queen I play these types of games on BigFish (and have been since early 2010, quit once joined right bk), and out of all the games I've played, Enchantia rates right up there with the best! The layout of the game, colour, the hob's or frog's, are great. Nice for a change instead of just finding a list of items from a list of words. The graphics were above a few of the best I've seen on BF yet! I really enjoyed this game and just dwnld the last Parables game; 'Dark Parables: Red Riding Hood Sisters. I don't usually comment on these games....takes too much of my time (lol). But these Dark Parables deserved a 'Hoo Yaa'! from me. Would b easy for Novices also. Great games! Rated 5 out of 5 by LKayeS3 from Another great game... I loved this game! The graphics were crisp and clear, the storyline drew you in, and a good mix of puzzles and HOS. This is one of those HO games where the HOS are pieces you put together to obtain an object you need for the game. I'll be on the lookout for Blue Tea's next game! Rated 5 out of 5 by centauri272 from Enchanting and challenging! This is a great Adventure/FROG! There is a lot to do. A map brings you to the starting point of a location, but not to the place where there is a task, making it challenging. The graphics are gorgeous so the objects are easy to find. The mini-games go from easy to really challenging. The cut-scenes are nice. Overall it's not a funny story but very well done! In Hard Mode, and not skipping, it took me about 4 hours.